2a or 2ax? You sure they are 2 something? Photos might help. Nice find for that price but the vinyl is disappointing. Very odd. 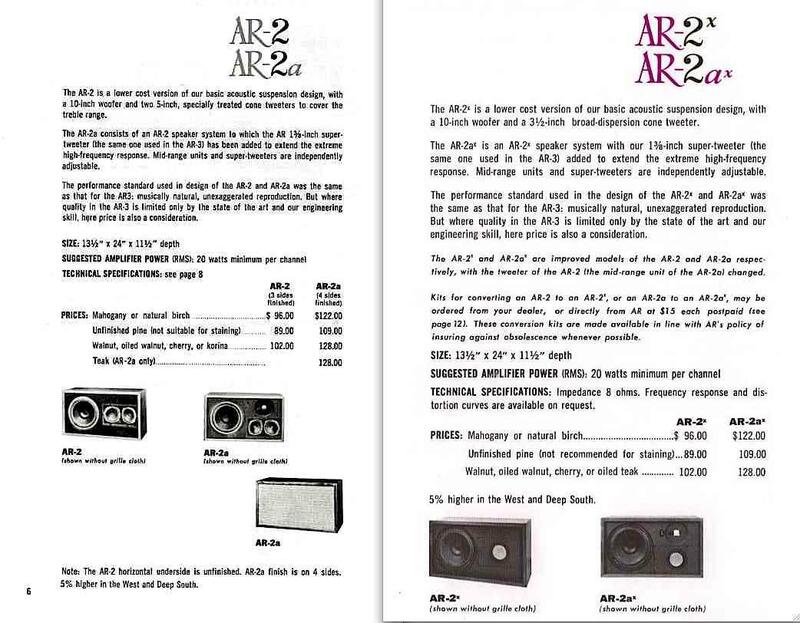 I looked an old AR brochures and saw no mention of vinyl for the 2 series but they did apparently change them in 1975 and maybe then they used vinyl? But if you have the AR-2, that's with the dual tweeters but no supertweeter. 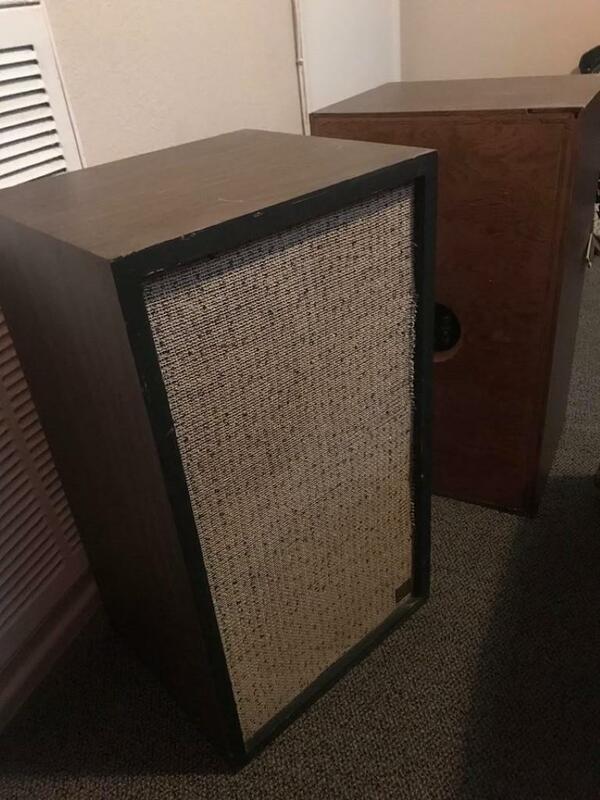 Then there was the 2x, which used the old 2 cabinets but put a plywood plate in the double tweeter hole and replaced it with a single tweeter but again, no mention of vinyl. I don't think they were still being made in 1975. This is a real puzzle. Maybe Tom Tyson will comment--he knows a lot of the history. btw, to post photos you need to resize them down to about 100KB or so. I use Photoshop Elements, resize pic to about 6" wide and 100 resolution, then save with Quality Level 8. OK so they're 2a (like you said in the first place) . I don't have a facebook account so probably won't be able to see them. Other members here also like to see pictures so the best thing is to post directly here. btw, to post photos you need to resize them down to about 100MB or so. I use Photoshop Elements, resize pic to about 6" wide and 100 resolution, then save with Quality Level 8. Welcome to the forum Robert. In his note, Kent meant to refer to file size of 100KB (not 100MB), and a simple jpg file format is best. 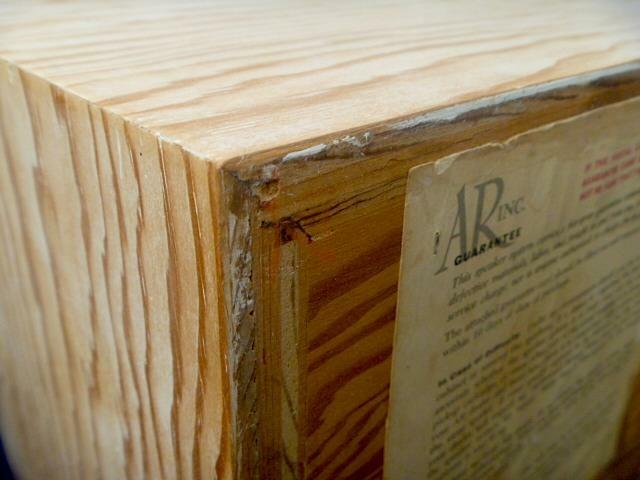 Just a wild guess, but perhaps Robert's 2a's were originally unfinished pine, and a subsequent owner opted to "jazz" them up with simulated wood vinyl contact paper? 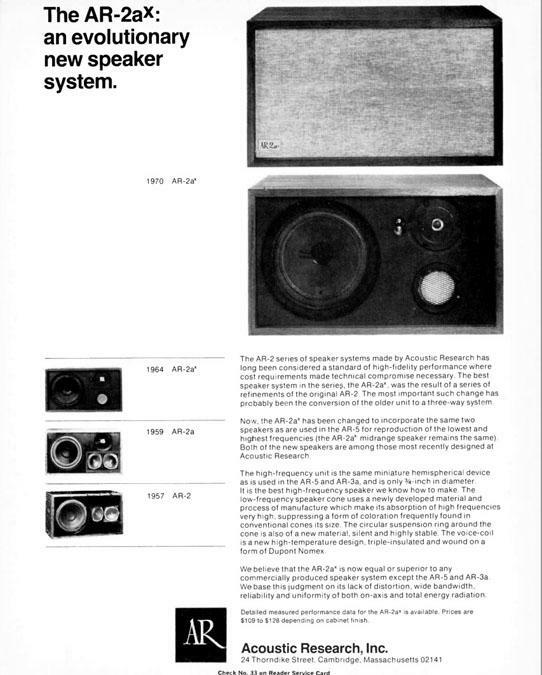 Vinyl certainly was not a factory finish - - I think the first appearance of faux-wood on AR speakers was with the AR-7 and AR-8. Hey Robert, you got my curiosity up. I resized your pictures and will post them for members to see. Perhaps my description as "contact paper" was not fully accurate, but I cannot come up with a better descriptor, and I'm sticking with my initial diagnosis. 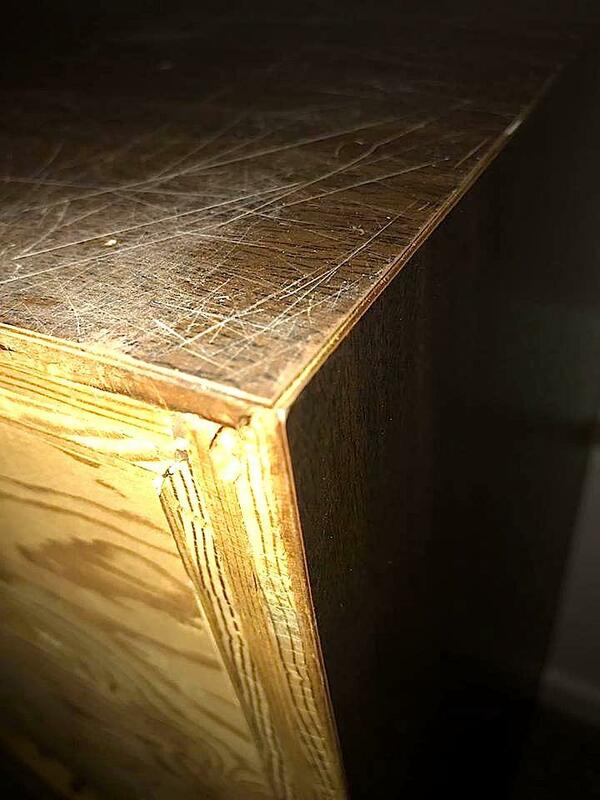 The black paint on the front moulding indicates that the person that wrapped these cabinets did not wish to contend with cutting and folding the 'wrapper' over the front miter joint and extending up to the baffle board. When looking at the single rear view, the side panels fabricated from plywood indicate that the original cabinet finish was indeed "unfinished pine". 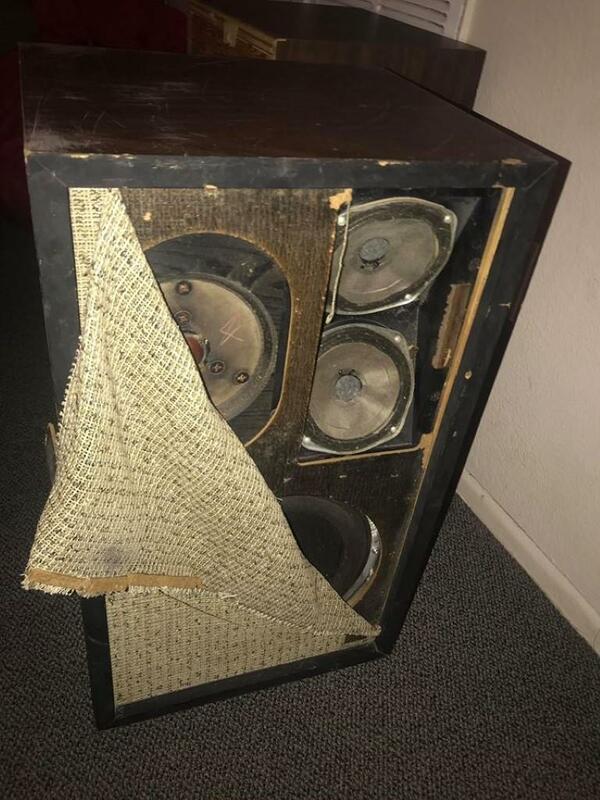 As far as dating these specimens - - without serial numbers - - your best bet is to remove the woofer and begin to inspect the backside of the drivers. It is highly likely that you will find a date stamp on at least one of these. While your speakers are opened up, it's a good idea to inspect the pot controls and the capacitors - - - more pics would be helpful for additional advice. 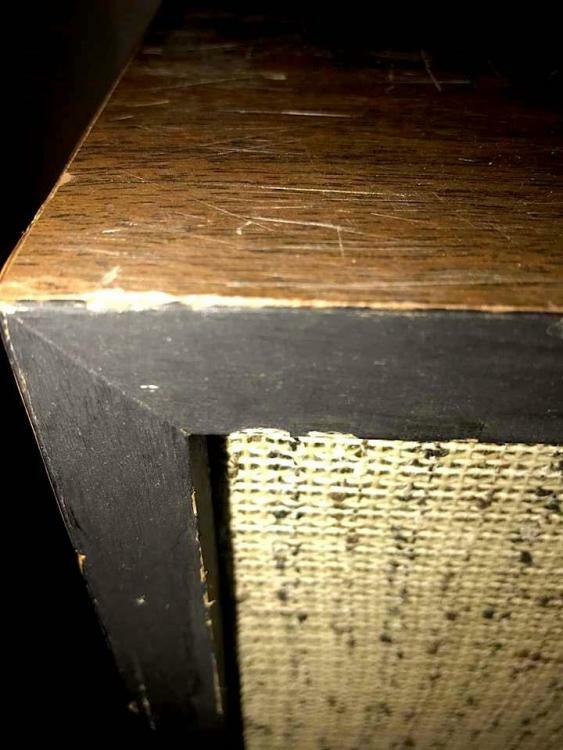 The pic attached shows both the inside and outside of a faux-walnut plasticized 'wrapper' that was stripped from a well-regarded popular vintage speaker from the early 70's. 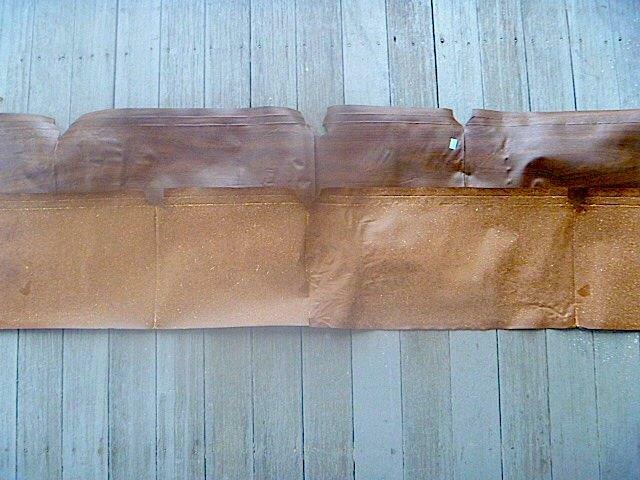 Over a particle board substrate, these adhesive sheets were applied as a single piece to cover all four sides, including the front nosing in two additional planes. This pic shows both the miter cuts and the folded edges. 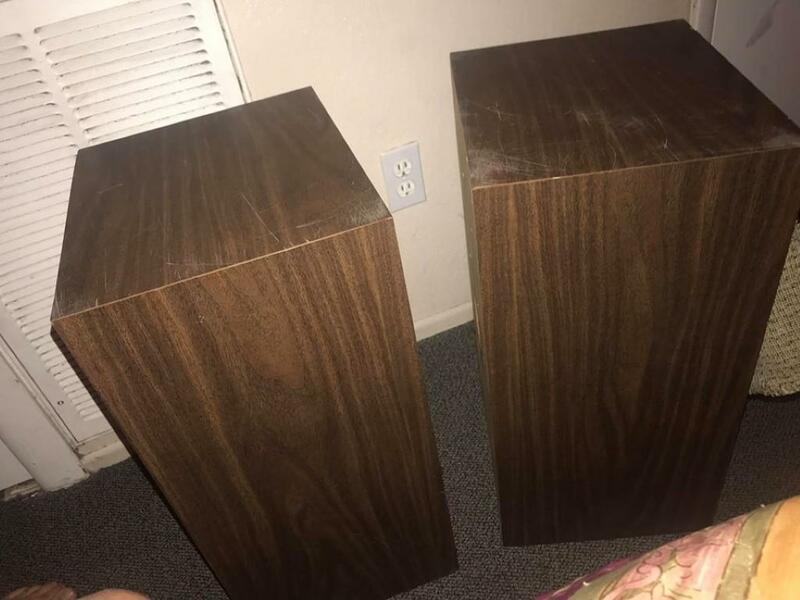 Robert, your speakers look to be in very good condition and you got a great deal. Too bad they are missing original labels, but you really should pay attention to inspection and maintenance of the interior components (caps and pots). As far as the visual aesthetics (faux vinyl and black paint), that's totally your call, but these 2a's have been cosmetically altered since they left the factory. Nonetheless....great deal on some great speakers! 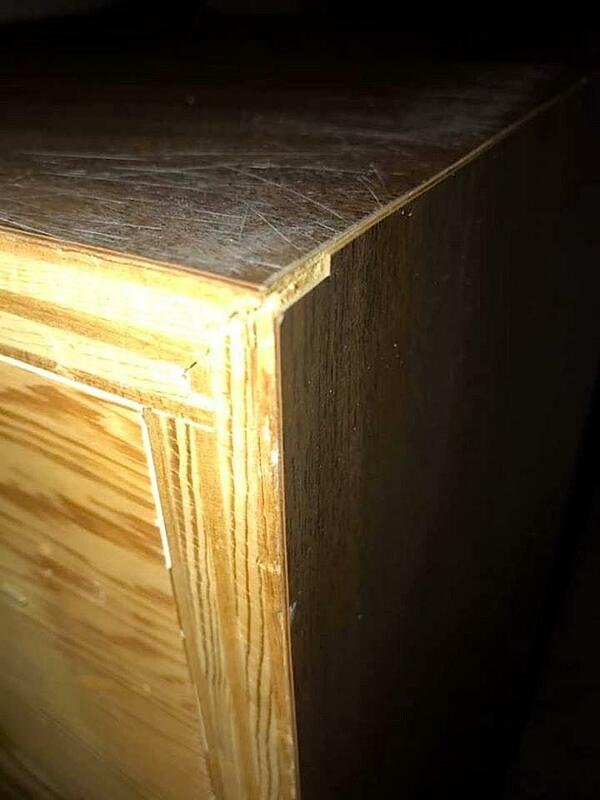 If you follow this (long) thread started by member owlsplace, you'll see a pair of unfinished pine AR-5's that have been clad with faux-walnut plastic laminate (i.e., countertop material), and I suspect this is similar to the treatment that your cabinets have received. Robert, are you stating for sure that these speakers are covered with vinyl? Any chance you could could post some additional pics - - maybe close-up(s) of front and rear corners? It would be helpful to see your specific condition. Also, I do want to be clear that in no way was I suggesting that applying plastic laminate might be a good idea. Of course, I am unable to 100% confirm your cabinet materials, but my guesses are based on what I've seen, including this view of utility pine cabinets, where you can clearly see that all panels (four sides, front and rear) are plywood. Robert, are you stating for sure that these speakers are covered with vinyl? I think his original photos show pretty clearly that they are the abominable "wood grain vinyl" (sorry Robert). And I'm sure you're right that this was an after-market attempt to snazz them up. If they were mine I'd remove the vinyl (although I don't know how difficult that might be) and either leave the unfinished pine or veneer them in real wood. As far as the vinyl wrappers that I tried to describe and showed in pic from earlier post - - yes, these can be usually removed with some attentive prying, muscular tugging, colorful cursing, and careful peeling. This vinyl is typically applied to particle board or MDF - - sometimes it peels off easily, and sometimes it is very tenacious. I've done this on two pairs of small-ish speakers - - - AR-18s' and Smaller Advents (shown in attached pic above). In both cases, I simply sanded the substrate and finished with shellac and/or satin polyurethane. IMO, already a vast visual improvement. However, in the case of Robert's AR-2a's, I think this is a case of "a picture is worth a thousand words". I was beginning to believe these were wrapped in the dreaded vinyl, but after looking at these pics from his FB page, it looks to me like it is in fact plastic laminate. 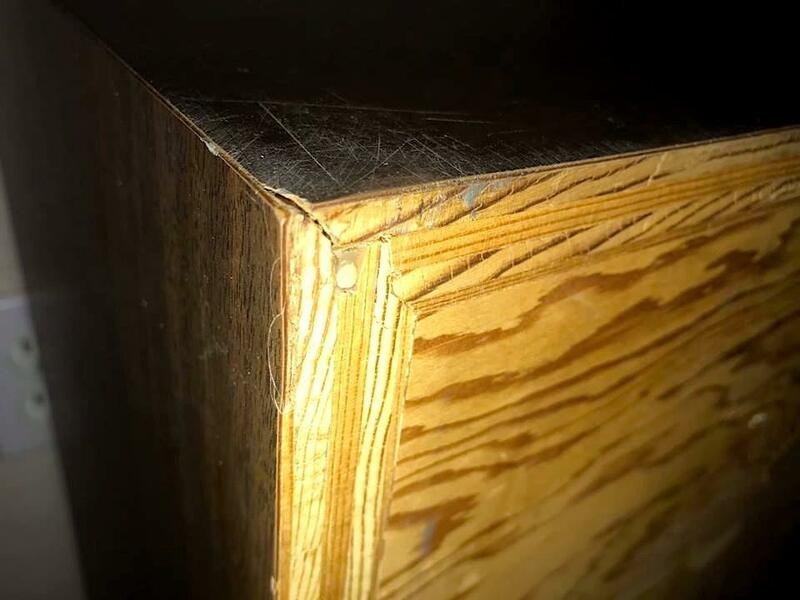 Laminate is typically applied with contact cement, and if the cement bond is a strong one, trying to remove the laminate would most likely damage the underlying pine plywood substrate. The pine cabinets typically had a front nosing made of solid birch, and in this case it has been painted black. What do others see here? Definitely laminate, and no way original. You can soften contact cement with a heat gun, and dissolve what's left behind with acetone. Nasty stuff, and you'll probably never get it all off. Plan on having to bleach the hell out of it and coating with a matte lacquer if you want to approximate the bare pine look, or putting a new veneer or pigment-based finish on the wood after sanding. Also, good chance the reason it was covered in the first place is that the wood was trashed, so be prepared for that possibility.